On the Japanese island of Kyushu, next to the pure river Kuma, there's a unique family-run Ohishi distillery, founded in 1872, uses sorcery to turn rice into Whisky. Yes, rice. 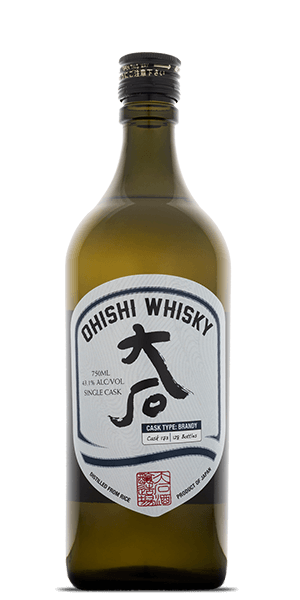 Where distilleries usually use barley, Ohishi uses Japan's favorite grain to create this superb sake-like Spirit. And not just any type: they use mochi rice from Kumamoto, and add gohyakumanishi rice, grown through organic farming and employs koi carp to control weeds. Ohishi's Brandy Single Cask is a blend of a small number of ex-Brandy barrels for an undetermined amount of time, which makes it a NAS (No Age Statement) expression. NAS is all the rage these days as it gives Whisky-makers freedom to experiment and find new awesome flavors. This bottle is a wonderful blend of Japanese and Scottish tradition and a must-have addition to every home bar. What does Ohishi Brandy Single Cask Whisky taste like? The Flavor Spiral™ shows the most common flavors that you'll taste in Ohishi Brandy Single Cask Whisky and gives you a chance to have a taste of it before actually tasting it. Sake note on the nose with touches of sour floral aromas and hints of nuttiness. Light and syrupy flavors of honey, tart apples and sake with hints of caramel and almond. Subdued finish with light oak tannins and toasted almonds. Perfect for sipping. Have yet to try it as a mixer. With it being so lightly flavored afraid it would get lost in a mix. One of the best Japanese Whisky I have had.